Apologies for the shorter nature of today’s blog. I’m on wedding duty so time is tight! The Cambridgeshire looks a typically difficult puzzle to solve. I have to air on the side of boring and say that I do really like the chances of the morning favourite CORNROW. With the prep run over seven furlongs last time being on the short side of what he wants, I think this has probably been the plan all along. I can see him running a very big race and in a race where you can get six or even seven places with some special offers he is a must back each way. He has been on the watch list since his reappearance back in April and won well for me last time out when appreciating the switch to this surface. Only a 5lb rise today and I think there is every reason to believe there could be plenty more to come. He is the best bet of the day for me. 2 pts win @ 11/2 generally. A strong traveller who has not quite been getting home over a mile recently and I have been hoping for a drop back in trip. Gets it today and is well drawn in stall four off bottom weight. I think he is really interesting! 1 pt each way at 12/1. Friday’s Blog: Der Meister Strikes! First and foremost I must kick off today’s blog with a thanks for all the kind messages about yesterday’s results. With Der Meister’s win at 12/1 it was a decent winning day all round but was very nearly much better! Prince Gagarin ran well off a slow pace but could only manage 2nd and after being absolutely smashed up in the betting into 9/4, Thunder Pass also ran well just failing to land the spoils. It seems that plenty of you put them into each way doubles and a treble because of the prices and had a lovely return. I think the place element of the treble paid about 17/1. A special note to Peter Nawab for his donation. The closer Thunder Pass’s race came around the more confident I became. He will come on a bundle for that run you would imagine and in hindsight when you delve into his pedigree, a mile and a half on the turf will probably suit slightly better. Let’s hope the handicapper is not too harsh on him for finishing 2nd. A really busy day today and plenty of action to get your teeth into and a really quality card at Newmarket. There is very little in the way of value on offer in the feature races. I am very much looking forward to seeing LUCIDA on our shores for the first time in the Rockfel at 2.40. She in the space of a month has very quickly made up into a smart filly. Today’s test is likely to bring about plenty of improvement in her and I struggle to see her getting beat today. Whilst I am not into putting up short priced favourites, I simply could not put you off putting her into your bets today. Ok in the search of a bit of value today I have managed to find one in the most difficult race of that day that I do actually believe is largely over priced. We are searching for the Friday night crown jewels in the form of COINCIDENTLY in the Silver Cambridgeshire (5.00 Newmarket). She has been in the notebook for a while as a potential improver and duly dotted up off a mark of 73 at Epsom four starts ago. She then ran poorly on her next start but that was just 48 hours later. She was back to form off her revised mark at Ayr three weeks later and ran a blinder to be second. Again she tried to back that up 48 hours later when traveling very strongly and getting no run whatsoever and Franny Norton gave up some way out and she effectively finished on the bridle. This shows she is still in rude health and also gives me belief that she is very capable of this career high mark. Granted, there are plenty of potential improvers in this field and the younger three-year olds have an outstanding record in the race so she has a task on but let’s look at the positives. Firstly she is a 33/1 shot this morning. She will be much bigger and largely ignored on the exchanges. Her three career wins have come in August, September and October suggesting she is an Autumn filly. Silvestre De Sousa has ridden her just twice and has won on her twice. I am obviously wary of the younger brigade but taking single figure prices in this type of race is the fast way to the poor house. In true Pricewise style I am going for the out of the park home run. I think she will out run those odds considerably and probably should be about 12/1. 1 pt each way at 33/1. Make sure you shop around for prices as some firms are paying five places. 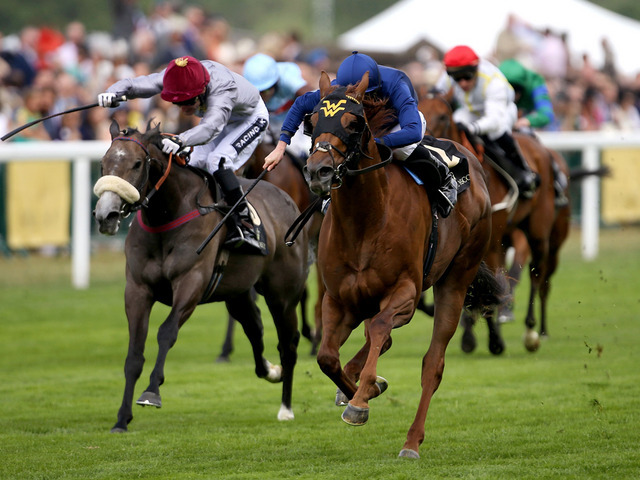 The second one I want to have a good go on today is WILDE INSPIRATION (4.10 Haydock). The lightly raced son of Dandy Man has been ultra consistent this season and still has plenty of scope for improvement having only had nine career starts to date. The main reason for him being a selection today though is down to the step up in trip. Three times on my race notes I have mentioned that he could benefit from a step up in trip and today he gets a mile for the first time. Paul Mulrennan has a good rapport with him and he also has the weight for age allowance. I really respect the chances of the rejuvenated Pearl Nation who has improved enormously for the switch to Mick Appleby but I am confident that Wilde Inspiration will run a big race. 2 pts each way at 8/1 generally. The two above are the main two interests of the day for me really but I do have a couple of others to throw into the mix. The first of these is PENGLAI PAVILION (3.45 Newmarket) who has had a poor season so far but on his best form, including a staying on fifth in last years Arc, he would win this comfortably. He has been given a break and gelded since his last run and if that has had a positive effect he might go very close to winning this afternoon. GREEK SPIRIT (6.20 Wolverhampon) has been largely out of sorts recently but just caught the eye last time. She is lightly raced and judged on her win off 6lbs lower last year this mark is workable. A very small interest at big prices. GHOSTING (9.20 Wolverhampton) is slowly slipping from an opening mark of 74 and did well to come from off the pace in an slowly run affair behind a Godolphin improver. This should be run to suit and although there are a few potential lurkers I am more than willing to have a stab at the morning price of 6/1. 1 pt win @ 6/1 generally. A really busy day then and some quality stuff. Coral TV this morning with an avid eye on the golf. What an atmosphere at Gleneagles this morning! Apologies for the lack of bloggage over the last few days. My schedule at this time of year is hectic and I simply haven’t had the time! I am actually writing this on Wednesday night just before I hit the sack as I have such a busy day again tomorrow! I will be up bright and early as I am off to Jamie Poulton’s yard down in Sussex to see our new colt that we have taken a healthy share in. He is by Sakhee and will be hopefully be making his racecourse debut in a couple of weeks time! Last week was quite tough. We hit the crossbar several times and had plenty that ranpoorly. I suppose on the back of such a good run that was always likely to be the case. I liked two quite strongly today (weds) and they both won well. I didn’t have the time to write about them in the morning but those of you that tuned into Timeform Radio would have heard how strongly I liked them! Monel would surprisingly easily and he is also entered on Thursday. He will be no sort of price now and the cat is out the bag. I hope in one way or another these figures point you in the direction of a winner or two! If you haven’t had a chance to check out Proform yet then you must do so. It is an essential part of any professionals day to day punting now and you will see why once you scratch the surface. Click on the image at the top of the blog and it will link you directly to the website. Simon will be happy to answer any questions that you may have. Ok on to today and a few that I actaully fancy quite strongly. First up is BALLYBOUGH GORTA (4.50 Wetherby) who has been most progressive over the last few seasons when given good ground or faster and has climbed a good 56lbs in the weights as a result. Over the winter he has been highly tried in decent races (Sussex and Scottish Nationals) mostly in bad ground which he would have hated. Back on a decent surface today in the weakest race he has run in for a long time (down to class 3) he must have a great chance with the Bowen/Moore combination also firing on all cylinders recently. There are some double figure prices floating about tonight so he should be backed provided there is not too much overnight rain! The first of my two very strong fancies is RUSSIAN REALM (3.50 Goodwood) who looks a pattern performer waiting to happen. He was beaten at Ascot on his re-appearance by the horse we backed that day (Ishikawa) and has been raised 3lbs for the privilege of being beaten. He travelled like the best horse in the race for a long way and if you could give Ryan the ride back again he might not have given the winner so much rope. The drop back a furlong should work the oracle here and I expect Ryan to be extra clinical here today on this beautifully bred colt. The other one on the day is PERFECT MUSE (5.35 Goodwood) who looks a really well handicapped filly to me. Adam Kirby had to get after her a bit earlier than he wanted on her re-appearance at Bath (when she was heavily punted) and she hit the front a bit earlier than I believe he wanted too and got swamped on the line when he thought he had the race in the bag. The extra furlong here should help her travel into the race kindly and if Ryan Tate times it well I fully expect her to win. I hope you all have a lovely day! And lets bag some winners! Morning peeps. Very best of luck to you if you are having a go at the massive Scoop 6 today. At first glance I thought it wouldn’t be won. Then I thought about putting a syndicate together to have a real crack, then I thought it wouldn’t be won again. My first effort at a perm came to over £2,500 so I banged my head against the desk, trimmed it right down and put up a small play. If I’ve narrowed down all six winners, this may be the last time you read this blog! I must give a huge shout to all the team at Sussex County Cricket Club. An enthralling finish to the first of the Natwest T20 blast games against Surrey last night saw the Sharks get 17 off the last over including 8 off the last two balls to secure victory. The place went mad and the shark tank was overflowing! Such a busy day’s racing today, let’s look at some of the Proform stats for today. Such a difficult day today. Every race of the scoop 6 looks difficult. We do have one or two runners from the interesting list. You are all well aware of me feelings about STOMP (3.30 Newmarket) who won really well for us just over a week ago on an epic afternoon. He is incredibly progressive and beat another very well handicapped rival last time so the 8lb rise is not too harsh and Joey Haynes claims 5lbs of that back. He can emulate his half-sister Mince on route to pattern company here. You would have seen me tweeting after AEOLUS (2.55 Newmarket) got beat last time in the Free Handicap after meeting trouble in running. His form at the back end of last year took a huge boost when Night Of Thunder won the Guineas and he looks a class act to me. If he’s come on for the run last time I would hope that he might be too good for these today. I am really looking forward to seeing TOKEN OF LOVE (5.00 Newbury) again this afternoon. She is a beautifully bred daughter of Cape Cross who was pretty green on debut but still managed to win with plenty in hand. She starts life in handicap company today off an opening mark of 77. She has a group 1 entry in the Coronation so she is clearly thought a lot off which means her opening mark today looks very attractive indeed. The 5/2 about her this morning looks very tempting! TOKEN OF LOVE 4 pts win @ 5/2. I have a couple to throw out the back of the hand at big prices for you today too. First up is GO GO GREEN (3.25 Thirsk) who I have had to put into my scoop 6 perm despite being 2lbs out of the handicap. He has won off much higher marks in the past so that is no worry and he has shaped like his turn is coming the last twice. He might be better at six furlongs these days but the nature of this race means they are going to go a frantic pace which should suit off bottom weight. Just a small dart at a big one. The other big priced arrow to throw later on is PIXIE CUT (5.25 Doncaster). You should all remember my thoughts on her as she ran in the Sirvino race at Hamilton. I am sure she is well handicapped at the moment off 70. This is a weaker race than that and I would actually fancy her quite strong but for the fact that she is really badly drawn in 19. Hopefully the excellent Rob Fitz who is claiming 5lbs can just get her into an ok slot and she might well run a big race at 12/1. Given the nature of the prices today I have played a couple of small multiples too. STOMP, AEOLUS and TOKEN OF LOVE in a treble & trixie. GO GO GREEN & PIXIE CUT each way double. Enjoy the action today, really is something for everyone withe the FA CUP final clashing with the La Liga final games! Good luck to Chris and Martin at Wembley!